With only 5 days until election day, members of SDS came together to give the City Council race in Pierson, Fl one final push towards descriptive representation. Dividing almost 100 phone numbers was no hassle among compañer@s. The list of registered voters rotated between six volunteers, each using their own cell phones to make the calls. With script in hand, we set out to survey voter support for Tony Ramos, the first Hispanic candidate to challenge the perpetual incumbents of this evolving small town. We also inquired about the need for transportation, since SDS will be offering rides to the polls on election day to ensure high participation in the democratic process. As with most phone-banking efforts, we ran into the common hurdles of disconnected numbers and absent parties. The people we were able to reach, however, had an encouraging response. The few undecided voters were politely on the fence yet open to listen, we had almost no straight negative responses, and the higher tallied number of answers fell under the Yes category. Moreover, those who expressed their support for Tony sounded enthusiastic and eager to cast their ballot. The results of November 2nd are hard to predict, but we hope our efforts will help Pierson, Fl bridge the gap between the people and their elected officials through the victory of Tony Ramos. At the turn of the 21st century, that image has been radically transformed. With tremendous purchasing power, it has become abundantly clear that migrants are an important economic and political force on both sides of the border. On the US side, recent mass demonstrations have made it clear that migrants are more than ready to mobilize for their civic and political rights therein. Far from being a zero-sum relationship, migrants are increasingly demonstrating an interest and capacity to democratically engage in the politics of their home and host countries. At the community level, an example of Latino political mobilization is unfolding in tiny Pierson, Florida. Tony Ramos, son of migrant farm workers from México and lifelong Pierson resident, is the first Latino to vie for city office in Pierson history. On a recent visit, SDS volunteers for Ramos’ campaign painfully realized the barriers to Latino political incorporation firsthand. With infectious enthusiasm, the campaign volunteers split up into cadres and set out to register as many voters in Pierson streets, stores and residences as they possibly could. At a local store, the campaign volunteers were kicked-out by store management, unsympathetic to the idea of a Latino running for office in their town. On the Mexican side of town, volunteers encountered the barriers to incorporation within the Latino community itself. Some eligible Latinos were rightfully skeptical that the political process would benefit their interest. “Why vote,” questioned one man. “Politicians don’t do any thing for us. Look at Obama,” referring to the current administration’s failure to act on immigration reform. Others were interested but ineligible to vote. “I can’t vote. I am a convicted felon,” said a young Latino Pierson business owner, who nevertheless volunteered to spread the word about Ramos’ campaign, seeing the value of a co-ethnic running for political office. “That is what we need around here,” he concluded. 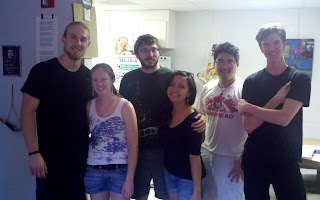 Demoralized, the first cadre of volunteers returned to the de facto headquarters of the Ramos campaign, with only one completed voter registration form to show for their efforts. There, Tony made conversation with a middle-aged Mexican migrant who offered words of encouragement to the group of visibly tired volunteers. “Don’t lose hope”, he said. “Little by little, people will spread the word about the work you are doing and become informed and interested in Tony’s campaign.” Indeed, this very well may turn out to be a gradual process of political (re)socialization for Latinos in Pierson. An earlier incident that day provides a telling lesson. 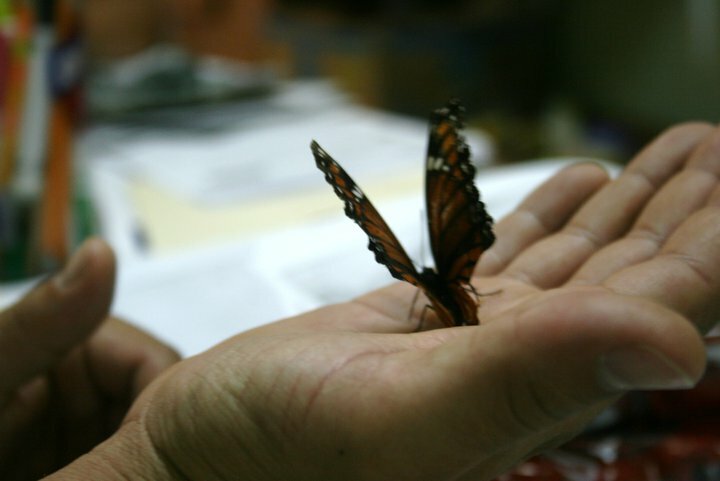 During the mid-day lunch break, when enthusiasm was still running high among the volunteers, Beto—a veteran of SDS—joined the group, holding in his hands a butterfly he found lying outside, unable to fly. Beto took the butterfly and delicately trimmed around her wings with a pair of scissors, as the rest of us watched in awe. “She can’t fly because her wings are asymmetrical,” he explained. Holding the butterfly up with his index finger, she tentatively began to flap her wings. “She has to learn to fly with her new wings,” said Beto. The work of the campaign volunteers is similar to Beto’s attempt to aid the butterfly. By insisting to register and mobilize Latinos to vote, Ramos’ campaign volunteers are attempting to get them to fly with a new set of proverbial political wings, and thereby challenge the asymmetric power relations in Pierson and, by extension, in the US south. This effort at migrant political mobilization can have far-reaching implications. If Mexican migrants, in particular, continue to act like “monarch butterflies”, that traverse political space, then they will likely challenge asymmetric power relations on a transnational, cross-border scale. Publix opened its thirteenth Gainesville branch this past Thursday, and the new store was welcomed by warm weather, blue skies and a group of activists with bullhorns. 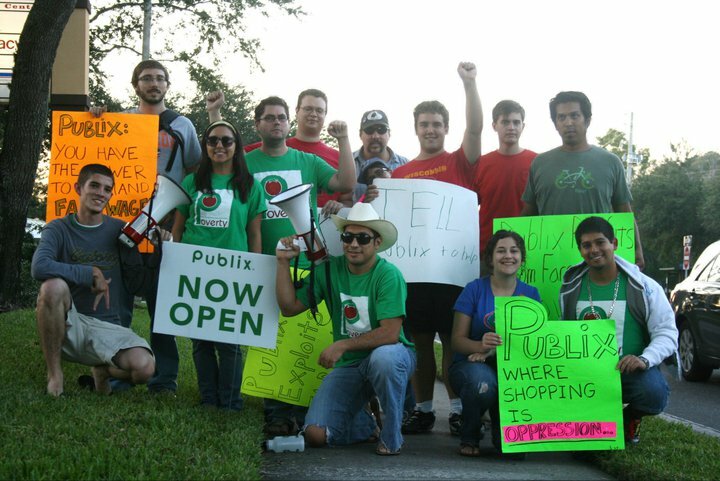 The demonstrators, coordinated by Gainesville Area SDS, were part of a state-wide movement asking Publix to sit down with representatives from the Coalition of Immokalee Workers to discuss contracts guaranteeing their farm workers a living wage. The CIW demands that Publix pay its farm workers a penny more per pound of tomatoes, and the corporation has consistently dismissed requests to negotiate. This past week the CIW coordinated labor rights actions in cities across Florida, making it clear that they would not be ignored. This is not the first time that SDS has worked with the CIW to effect change. Following a series of protests and boycotts facilitated by SDS, a coalition of organizers successfully negotiated a contract with Aramark, the food distributor for the University of Florida. This past February Aramark agreed to improve the wages and working conditions for the farm workers who supplied produce to restaurants and dining halls on campus. Because so much produce in the Florida area comes from Immokalee, the CIW has struggled to represent the interests of immigrant labor for over a decade. The group has uncovered and brought attention several cases of modern day slavery in Immokalee, and works to bring justice to laborers across the Southeast. 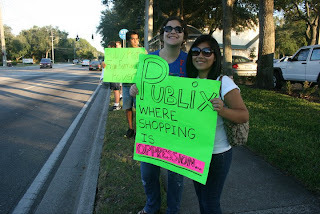 On Thursday, SDS helped garner awareness and support for Publix workers with a group of twenty-five students and community members. Activists came out for the morning’s grand opening ceremony, and returned in the evening to reach rush hour traffic. Stationed on the sidewalks outside the store, protesters held signs demanding living wages for farm workers while SDS leaders Dave Schneider and Diana Moreno used their megaphones to lead chants and ask Publix shoppers to bring up the issue to store managers. The group was positively received by customers and passersby, and some cars stopped traffic to shout words of worker solidarity through their windows. The local media in Gainesville documented the day of action, Moreno, explained to a newscaster that neither SDS nor the CIW were trying to demonize Publix, its employees or its customers. The demonstrators, she explained, were just asking the corporation to treat its workers with the dignity and respect they deserve. In its mission statement, Publix commits to being a responsible citizen of its community. SDS and the CIW will ensure they live up to that promise. As a crowd in white assembled in the Plaza of the Americas of the University of Florida on Thursday afternoon, many passersby approached to hear a much needed message. 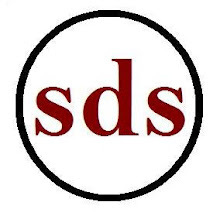 The war in Afghanistan has now been going strong for a full nine years, the longest war in U.S. history, and on this ninth anniversary, Gainesville area SDS took a public stand against it. With a campaign consisting of wearing white shirts to show support for peace and an end to the war in Afghanistan, SDS recruited several hundred students across campus to participate. This day-long display for peace culminated in a rally in the late afternoon with eight organizations and many student and community supporters in attendance. Fact sheets were distributed at the rally informing those attending of disturbing figures regarding the war, and why it needs to be ended. The demands were clear: end the war now and bring the troops home. Speaking to a crowd of about 50 people, ten representatives spoke through a megaphone in support of these demands. Organizations showing solidarity with SDS in its campaign included both Code Pink and Campus Code Pink, Students for Justice in Palestine, Students for Peace in Korea, ISO, the Farmworker Association of Florida, and Vets for Peace. All of the speakers had important and often moving things to say. Fernando Figueroa of SDS affirmed the long-standing tradition of SDS demanding funding for jobs and education, rather than imperialist wars. John Fullerton of Vets for Peace reminded the crowd that the best way to support the troops is to bring them home. Michelle Harris from Code Pink reaffirmed their opposition to the false idea that this is a “war of liberation” for Afghani women. Speaking on behalf of SDS, Conor Munro brought to light the often unnoticed fact that the United States has been in Afghanistan for almost half of most college students’ lives, while a seventh of the population of the US lives in poverty. Mark Jaskowski of the Gainesville ISO also connected what often seems like a distant, irrelevant war to our situation here at home, reminding the crowd that it is our generation that is and will continue to be sent to war until it is stopped. Tying all of these issues together as interrelated, Dave Schneider (SDS) called for a renewed commitment to rebuilding the anti-war movement, a goal to which many who left the rally felt it was time to take seriously. This final note of optimism to rejuvenate the anti-war movement will surely lead many toward activism, and if necessary, result in a commanding presence in the rally of the ten year anniversary.